View Poll Results: Wich of these Selkes would accompany you to the bottom of the sea? My excuses for the poll being up so late, had a busy and tiresome weekend (sailing ftw) and was a way for a good part of monday. Then add exams, and you can see my busy-ness . Either way, here it is, I hope I included everyone. If I didn't, then PM me please. Good round guys! Lots of entries again, i'm proud! My vote went to Jerik, love the clean, finished look over your painting. Voted for KVC, Lovely concept and rendering. I prefer the type of poll in the CHOW, where you can wote for mutiple entries. I feen there's more than one here that deserves a vote. I like KVC's best! Too bad it's not colored, but the polished look you gave it made the difference between yours and Jerik's. However I do like Jerik's idea. But I cannot compare the style of Jerik's with KVC's. I prefer realism over most styles and the way you colored it made me no longer think or realism but it went towards the more simplified style. It may just be me personally sticking too close to the given story, but I think one thing that was generally missing from many of the entries was the use of the general story of a selkie. Either the heartbreak of the person who loses their love to the sea, or the pain caused by the loved one who won't let go of her. I think that this story is part of what makes it such an interesting topic. Crits/suggestions in no particular order. Feel free to ignore. k-forthun and zelda_geek: really cool ideas. kwc: you get my vote. I think you might have been able to emphasize the seal a bit more, as if I didn't know what the subject was, I would have no idea what was going on. I like that you've included the man. 'Jerik: I really like the seal skin she's holding. I'll have to agree with Mtijn's summation of your piece however. Wanna: For pencils, may I suggest avoiding shading by smudging and rubbing. It makes you lose the form of things, and can be very messy. lysgaard: The sky is looking a bit green my friend. I'm still noticing the -legs should be in the rock- thing as previously mentioned. isha: You have the same thing going on that I noticed with lysgaard ealier:the human body of the selkie and not in keeping with the seal and therefore if they were to physically be where they are, they would have to have their legs sticking out below the skin. self: Do not adjust levels at last minute and expect to have time to fix it. Do not overwork. Hair should not be black, black. I kinda liked how the walls turned out. dkumkum: Currently, this makes me thing, girl standing on rock. what does the skin have to do with her. I think some interaction between the two, or an action showing she came from that direction might help. I really like how you did the water. Daxnassrac: I think you might want to check some anatomy in the near future. Her hip/stomach area and arms look a bit painful. Thoughts and personal opinions on pieces. Self: I really should have spent more time on this and given it more attention. PixieTrick: What exactly is it I should do to improve the anatomy? I like the grey tones, they add a lot to the mood of the piece and I'm glad you kept to the story. I can definitely tell that this is a selkie. Jerik: I love yours, I think the anatomy is great, the colours are soft, and the idea is unique, cute. Isha: I'm happy with the idea of the male selkie and I wish I could see the female a little bit better. The colour tone is very nice. K. Forthun - It is very well drawn and coloured, and for that I appreciate the piece. But it doesn't make me think "selkie" at all. If I'd seen that out of context I would have thought it was a teddy bear themed superhero. KWC - Definitely had my vote. It has the selkie theme, I love the expression and the grey tone, the water is beautiful. Zelda_geek - I love the idea of this one, if the submarine had been somewhat transparent and you could see the woman inside of it, it would have had my vote. KWC gets my vote for a very moody picture. 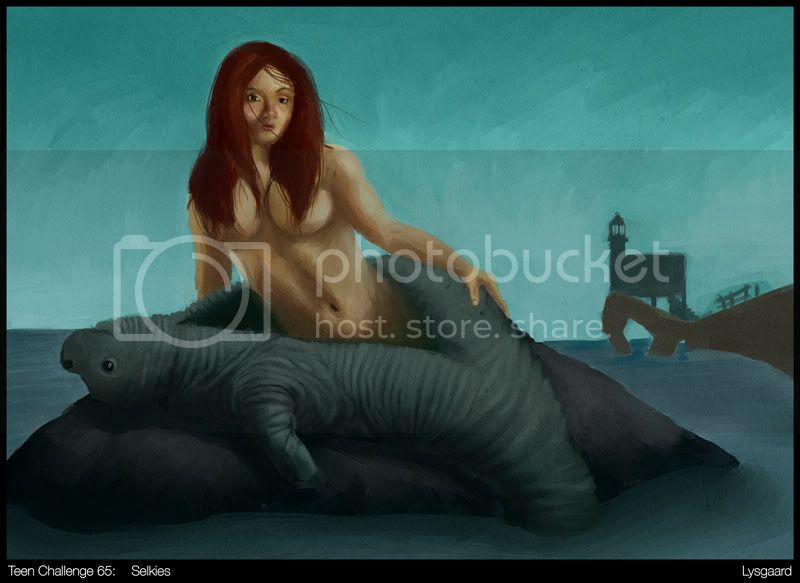 The woman's expression fits in very well with the stories I've heard of selkies. This is really quick, and I'm know I'm off in a gazillion places (this is not my strong point! ), but it gives the idea. I hope you don't mind the paintover, but it's much easier to show than to say. Note: elbows match up with the waist, and hands, when flat reach approximately, upper thigh.